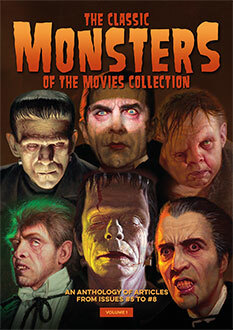 To celebrate the tenth anniversary of the true beginning of the horror film, Universal commissioned a new monster. Desperate to find the perfect niche in which to exploit Lon Chaney Jr, the studio gave penmanship of the project to dependable Curt Siodmak, whose near-perfect screenplay for The Wolf Man gave us not only one of the greatest horror films of all time, but possibly Lon Chaney his finest hour. As doomed Larry Talbot, Chaney gives a performance to within an inch of his life, and it is clear to see why he came to dub his beloved Wolf Man his “baby”, allowing no-one else to don the yak hair and play the role. In fact, Talbot is the only Universal classic monster ever to be portrayed by just one actor. 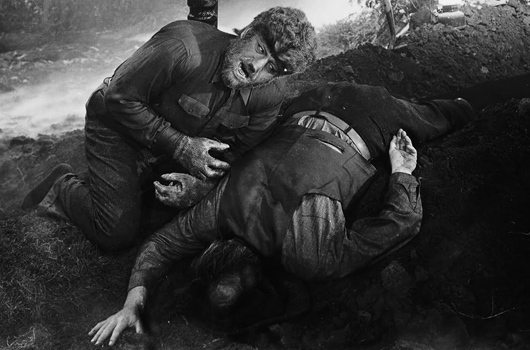 Spectacular and sumptuous on just about every level, The Wolf Man is a striking piece of intelligent filmmaking which deserves its place in the greatest that cinema has brought to us in its entire history. Still derided by certain critics who really ought to know their craft better, The Wolf Man is a superb piece of storytelling realised by taut direction and production on the part of George Waggner, thrilling set design by Jack Otterson, and exemplary camerawork by Joseph Valentine. 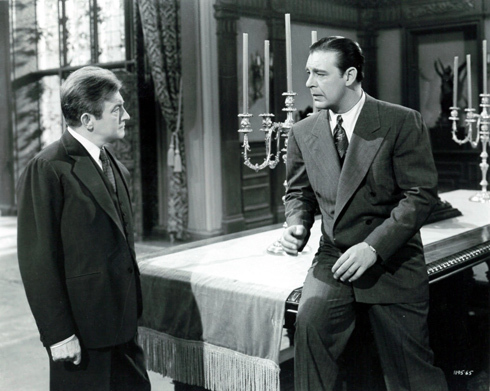 A stellar cast, led by Claude Rains and ably supported by Chaney, Maria Ouspenskaya, Bela Lugosi, Evelyn Ankers and Fay Helm, is not let down by even the weaker, more staid performances of Ralph Bellamy, Patric Knowles and Warren William, who at worst are entirely passable. 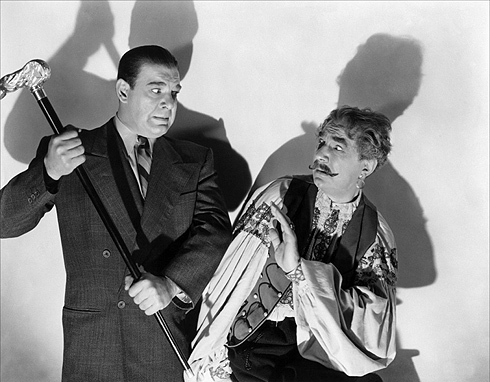 Returning from America to his ancestral home in a small Welsh village, the estranged Lawrence Talbot (Chaney) is reunited with his stiff and starchy father Sir John Talbot (Rains). The latter laments that it has taken the death of Larry’s brother in a shooting accident to bring them back together, and insists there should be no such reserve between them in the future. While working on the repair of his father’s telescope in the attic observatory of Talbot Castle, Larry inadvertently trains the lens on Conliffe’s Antiques Shop, where he observes the beautiful Gwen Conliffe (Ankers) donning a pair of half-moon earrings in her boudoir. Effecting to meet the lass, despite her engagement to the Talbot estate gamekeeper Frank Andrews (Knowles), Larry escorts her to a gypsy camp in the woods along with gooseberry best friend Jenny Williams (Helm). Here they meet Bela the gypsy (Lugosi) and Jenny volunteers to have her palm read first. Finding the wolfbane the girl takes in a little claustrophobic, Bela struggles on to advise her that he can tell her nothing tonight, as he has – unbeknown to her – spied the pentagram in the palm of her hand, indicating she will be his next victim. Running from the tent terrified, Jenny discovers to her horror that the silent prophecy of the gypsy werewolf comes true and, responding to her screams, Larry rushes to the rescue. He battles with the wolf but is unable to save Jenny, and gets bitten himself during the ensuing struggle in which he beats the animal to death with a silver-headed cane. Larry later learns from the old gypsy woman Maleva (Ouspenskaya) that he himself has now become infected by the curse, and accepts a charm from her for protection, which he later gives to Gwen. Shaken and confused, Larry soon becomes ensnared in the mystery of whether he killed a man or a wolf, and all too quickly gets confirmation of his worst fears when he himself turns into a werewolf at the full moon. Murdering local gravedigger Richardson (Tom Stevenson) turns attention on the hapless Talbot, and he becomes the object of suspicion among many of the townsfolk, who are already gossiping about his relationship with Gwen, and including childhood friend Captain Paul Montford (Bellamy). Despite reassurances from both his father and family physician Dr Lloyd (William), Larry is convinced he is a werewolf. Desperate to prove him wrong, Sir John straps him to a chair while going out to join the hunt for the beast that is terrorising the neighbourhood. Daunted by misgivings, he is on his way back to the castle when he runs into Maleva, who forces him to face his fears. In the meantime, Larry has broken free and is in hot pursuit of Gwen, whose screams alert Sir John to her distress. 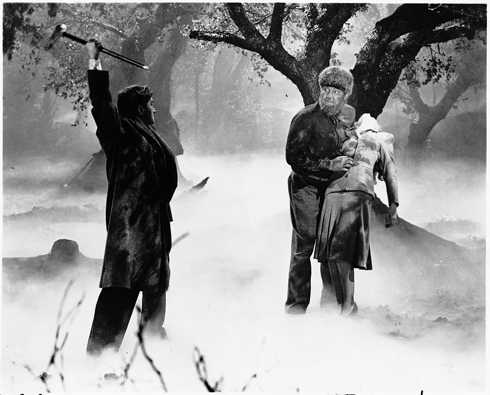 Dashing to her aid, he wrestles with the Wolf Man, ultimately beating him to death with the same silver-headed cane Larry had used to kill Bela. As Maleva arrives, the beast reverts to Larry, and the assembling onlookers, including Gwen, view the scene with horror and confusion, with Sir John apparently in deep shock crouched over the body of his son. Escaping the formulaic Mitteleurope locale for The Wolf Man, set designer Otterson created what would become the archetypal “spooky forest”, with its twisted trees and snapped boughs perpetually shrouded in mist. Jack Pierce’s make-up for Chaney, which took four hours to apply, albeit in stages for the transformation sequences, has become as iconic as any other Hollywood monster from the golden age. 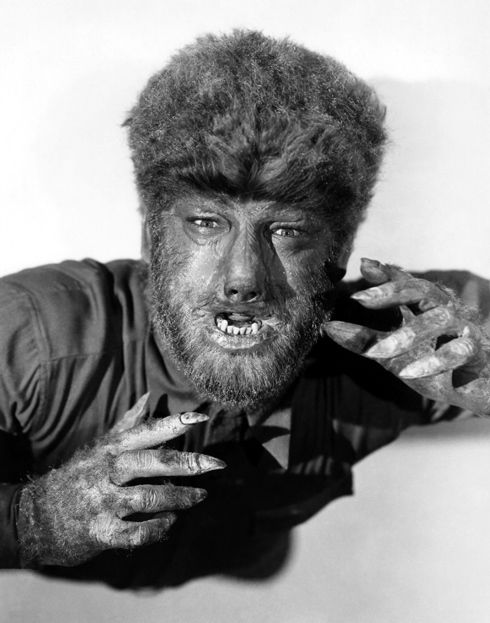 Siodmak’s invention of much lycanthropic folklore, including the wonderfully intoned rhyme “even a man who is pure in heart and says his prayers by night, may become a wolf when the wolfbane blooms and the autumn moon is bright” (so good they used it thrice), which is actually now attributed to genuine medieval sources, combines well with The Wolf Man’s myriad other qualities to make the film a first-rate classic. 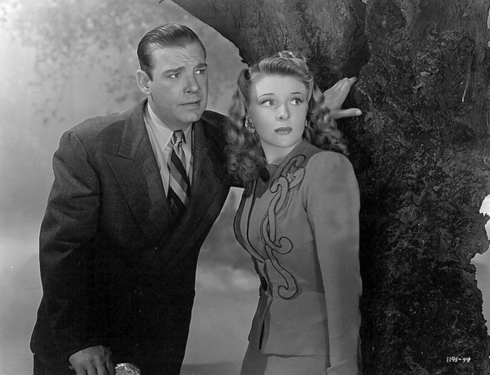 Universal had only lightly courted the subject previously with their 1935 Werewolf of London, in which Henry Hull doesn’t wear the full Pierce make-up, partly so as not to obscure his classic profile, but also to allow Valerie Hobson to recognise him in wolf form. Their only other dalliance with fur had been a proposed vehicle for Karloff in the 30s, which had never seen the light of day. Despite lukewarm critical reception, The Wolf Man became one of the studio’s hottest properties ever, earning them millions of dollars and garnering Chaney the highest amount of fan mail ever received by a star on the lot. The Wolf Man’s strength undoubtedly lies not only in its sterling lead performances, but also those secondary roles such as Bela, Maleva and Jenny, which in less skilled hands would have been flat and emotionless. 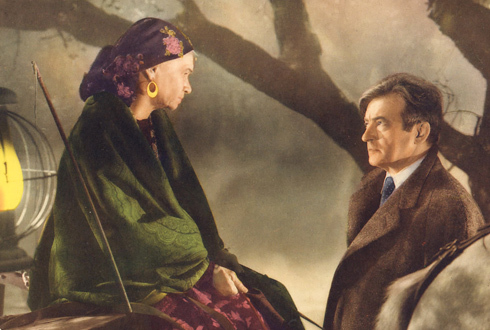 Lugosi and Ouspenskaya make the absolute most of what they have to do, and deliver multilayered performances which make not only their characters, but the film as a whole sparkle. 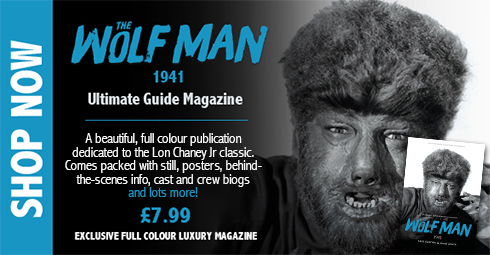 Viewing The Wolf Man today in gloriously restored Blu-Ray format seems as thrilling as it might have been on the big screen upon its release, but one can only imagine what the impact of Chaney’s snarling, savage characterisation, enhanced beautifully by Pierce’s faultless make-up, would have been on cinemagoers of the day. The Wolf Man is a wonderful picture, and a true classic deserving of the highest accolades which could be bestowed upon it. 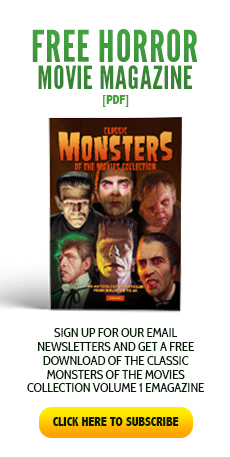 One of the best Universal monster films. I like it when a vested Larry transforms into the wolfman and then manages to put a shirt on and fasten the buttons…with those paws!